I grew up with Greek people. I've been lucky enough to experience Greek weddings, Greek funerals and feasts of the dead, Greek parties and Greek food. Lots and lots of Greek food. Most people around here will probably tell you that they like to eat Greek, but I bet you they will all cite the same cast of characters: gyro, Greek salad, pizza and baklava. These are all great dishes to be sure, but there is so much more to Greek cuisine. Ariana's is a new Greek restaurant in West Columbia, not far from the Botanical Garden entrance on 378. I'm not sure how long they've been open, but it hasn't been long. I ventured in with my mom and a friend for lunch the other day. They serve gyros, of course, but they also feature moussaka, pastichio, tandoori chicken, dolmades, and spanakopita. But what's pleasantly different is that they also have tons of lamb dishes which is really hard to find anymore. Back in the good old days, the Epicurean was THE place for lamb. I remember lamb chops with mint, "lamb for lovers" and lamb chops "bandit style." And these were real lamb chops too, not the miniscule "lamb-pops" that show up in our stores today. Seriously, are they slaughtering these poor animals a week after they are born? Well, Ariana's is serving lamb. You can get souvlakia on a pita or as a platter, grilled lamb kabobs, and rarely seen items such as lamb with carrot, raisin & almonds, lamb stew and a spinach stew with lamb. And here is something my buddy The April Blake will relish: there are 5 vegetarian dishes on this menu! I also love the fact that their decor IS NOT the typical, tacky Greek restaurant decor. It's bright, fresh and clean. No weird marshmallow-like structures covering the ceiling, no Greek fishermen painted on the walls by someone's aspiring 3rd grader, no run-of-the-mill food service style chairs and hard plastic plates. Ariana's uses modern place settings, cloth napkins and stylish furnishings. However, I found it a bit odd that the table we had was not as long as the booth seats. That was a little strange; hopefully something temporary. And, I must admit, I was duly impressed that the table is outfitted with a salt grinder full of lovely pink salt. Very nice touch! The owner is on-site, the ingredients look and taste fresh, the menu is different and interesting and the prices are more than reasonable. I hope this restaurant will enjoy long success here in Columbia. For those of you who would like to venture out and expand your Greek food horizons, try them out. Don't get me wrong, there are plenty of times that a big ol' Greek pizza is calling my name and I wouldn't change that at all. But it is certainly refreshing to see a restaurateur open up and spotlight some lesser known Greek dishes. And he's doing it well. 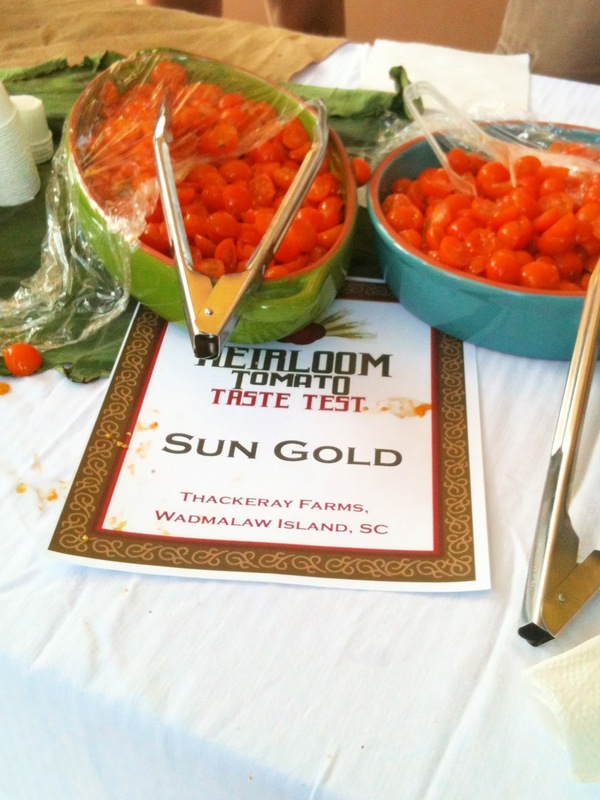 Today was the 4th Annual Palmetto Tasty Tomato Festival. Four years, right in my own neighborhood, and we've never made it until today. So, the three of us hopped on our bikes and followed the music to City Roots. I'm glad we got there early. 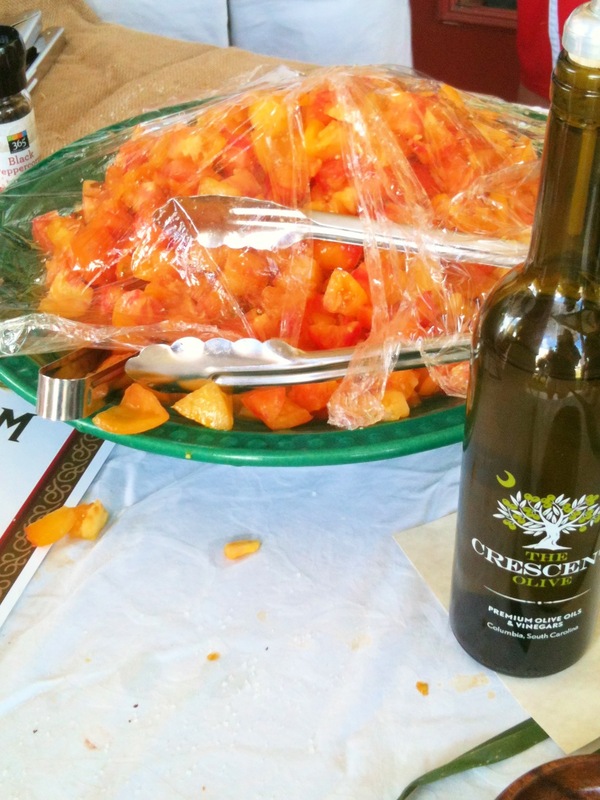 Right off the bat, I was able to go through the tasting line, which featured beautiful, colorful and unusual varieties of tomatoes, paired with lovely olive oils from the Crescent Olive over on Devine St. I'm not really much of a fan of the little tiny tomatoes, but I tried the chocolate cherry and another one that was bright orange. I also sampled the Cherokee Purple,Sun Golds and my favorite Mr. Stripey. 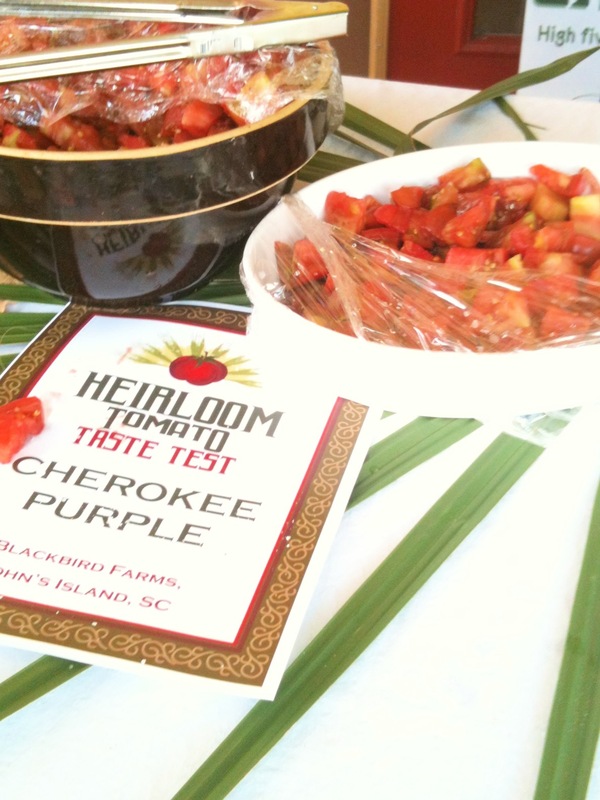 Not only do I love that name, but I loved the fruity sweetness of this tomato. Hats off to the Crescent Olive people on the oils and pairings. There were baguette slices to dip, salt & pepper to grind and oils from oregano to chipotle. Like I said, I'm glad we got there early, because by the time we left, the tasting line was quite long. This festival is certainly a celebration of the tomato, which might as well be named the official fruit (yes, Virginia, it IS a fruit) of the South. 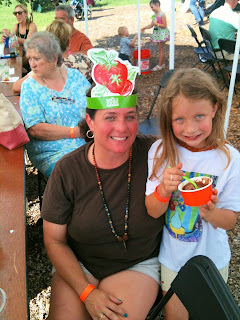 The vendors that participated also featured the tomato in one way or another. There was a bloody mary bar, tomato hand pies by Spotted Salamander, tomato basil ice cream by Paradise Ice, fresh squeezed lemonade with add-ins such as tomato-cucumber as well as other fresh fruits, gazpacho, fried green tomato BLTs, regular BLTs. However, the star offering was Rosewood Market's "Old Fashioned 'Mater Sandwiches." I mean, bravo Rosewood Market, for serving up what probably 95% of the Southern population considers the ultimate summer sandwich. 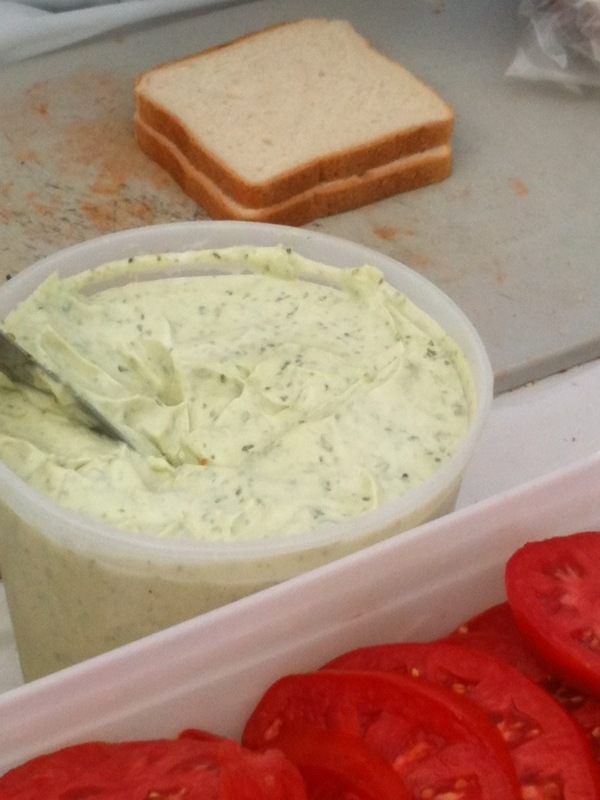 We're talking white bread, gorgeous red tomatoes, and mayo. That's it. 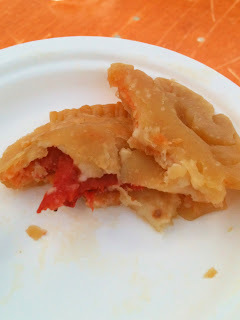 They were also offering a basil "veganaisse" but a purist knows that the 'mater sandwich really isn't about veganism. It's about basic ingredients with juicy tomatoes that run down your forearms as you devour it. 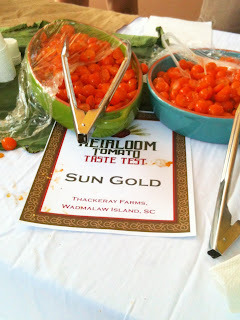 One thing I expected was that I'd walk away with a big bag of cool, funky, crazy-shaped heirloom tomatoes. 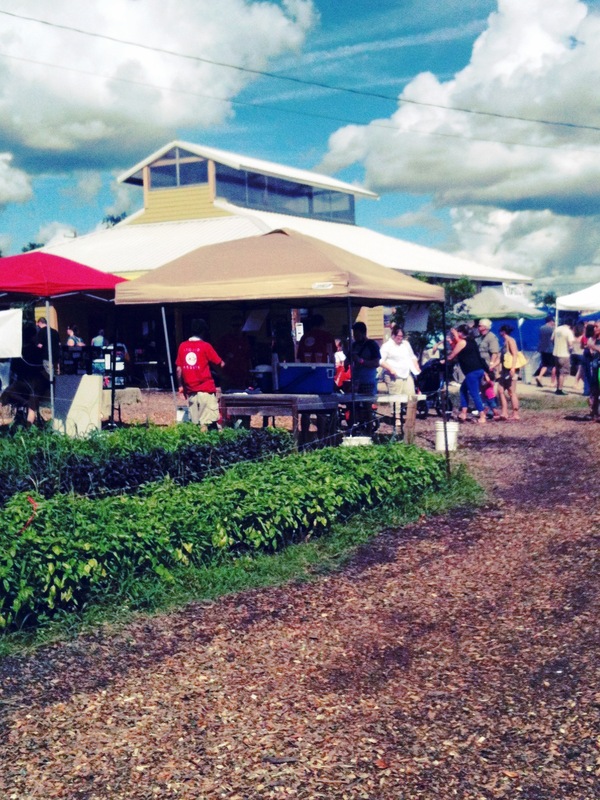 However, only City Roots had a booth to sell veggies/fruits. 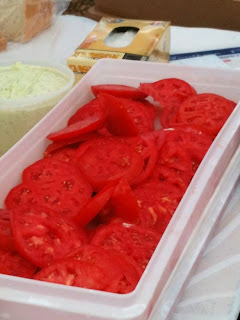 They had some pretty, perfectly round tomatoes, but I wanted some of those lunatics of the tomato world. Also on the table were yard-long beans, all of City Roots' killer microgreens, lovely basil and what I think were purple carrots. We were able to walk through the greenhouses too, which was really cool to see. Outside, they had "Mater games" set up alongside the outdoor garden of the longest row of basil, Japanese eggplants, rosemary, dill, mint, just to name a few. 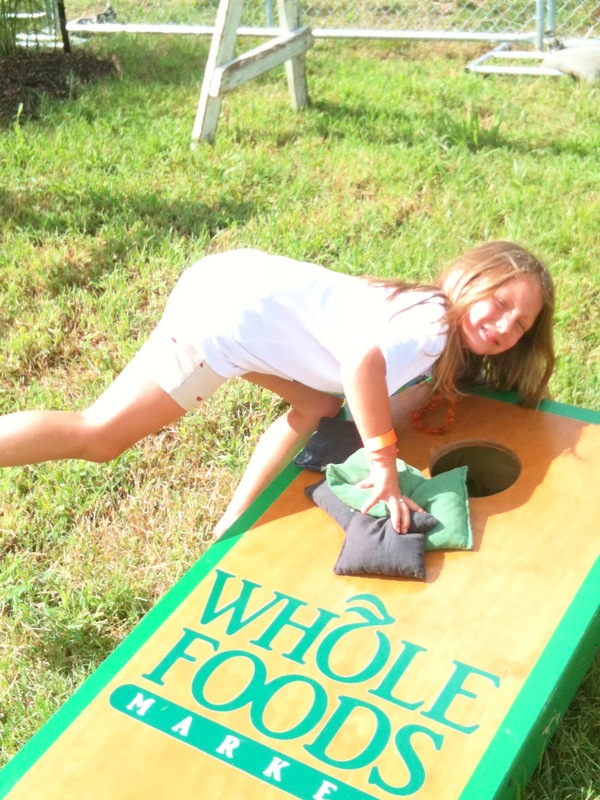 In addition to all things tomato, the festival also features kids' games, live music and some killer restaurant offerings. I regret not being able to attend the first 3 festivals, but am really happy that we made it to #4. 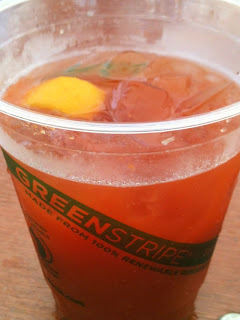 We had a great time, ate some super food, a spicy bloody mary and a couple of good beers and then pedaled home. If you're unfamiliar with this festival, make sure to check out this link so you can be prepared for next year! Those of us who love food have been driving by, wondering, imagining, obsessing about the opening of this strange, new US Foods Chef'Store. What is it? When will it be open so I can check it out? Will I cross the threshold and completely lose my mind? What is this gigantic former Piggly Wiggly going to contain? The giddy excitement was becoming unbearable. Well, it's finally open and I was able to make a small foray into this enormous culinary mecca. In a word? Whoa! It's amazing. 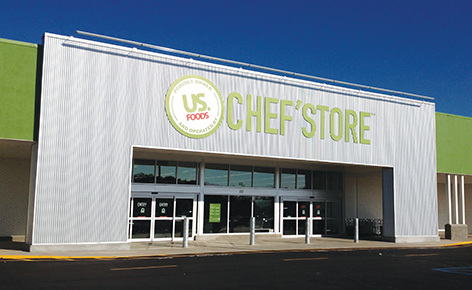 Obviously, this is the place to shop if you own a restaurant or a catering company. I saw the equivalent of a sheetrock bucket full of soy sauce, a gallon of olive oil, cases of avocados and every type of to-go box known to man. But, there are still items here that fit into the everyday domestic kitchen. Unfortunately, I only had about a half hour, so I didn't even make it through all the aisles or the meat department. I did have time to find two super awesome products. Caperberries and white truffle oil. I have an intense love of briny, sour, pickled foods. I crave Claussen's pickles and have actually gotten in my car to drive straight to Publix. I mean, when it hits, I want a pickle and I want it now. (Here's where the husband makes some pickle innuendo joke!) I love capers on just about anything, including on a spoon. Yes, I've been known to eat them right out of the jar. But, caperberries are a whole other matter. The first time I had them was about 30 years ago when my family was in NYC. We discovered them in Dean & DeLuca and all went crazy for them. Try finding them in Columbia, SC. Virtually impossible except in the occasional gourmet shop where they've been priced as if they are Beluga caviar. Not anymore! I got this huge jar at Chef'Store for 6 bucks and some change. As you can see, I've already made a pretty significant dent in them. I admit it! Now, truffle oil is another thing that those of us here in the South simply didn't grow up with. I've heard of it, of course, but it wasn't until about 2 years ago that I finally got to try it. My pickle-joking husband gave me a little bottle of it for my birthday. As tacky as it is, I had to know how much it cost. $22 for a bottle that was probably less than one fluid ounce. (Remember those shops with Beluga prices?). Well, here at the glorious new Chef'Store, I got 9 oz. of white truffle oil for about $11. I seized the moment, you know, carpe diem'd it. I was so excited, I practically ran to the cashier. So, now I am armed for truffled risotto, truffled eggs, and one of my favorites, truffle-drizzled french fries! Seriously, if you haven't ever tried that, you must give it a try. This store is really fascinating. The prices are more than good and if you do need large quantities, it's there. But, you can still shop for yourselves. You just might need to split with friends. For instance, a case of avocados (48) is only $19.98. That's $0.42 cents per avocado. The grocery stores act like they're doing you a favor when they put them on sale for $1 apiece. So, get 5 or 6 friends to split one case and for roughly $4 each, you all walk away with lots of avocados. If anyone is interested in going in on this deal with me, let me know. Really. I'm serious. The US Foods Chef'Store is located on St. Andrews Rd, right off I-26. For you Irmese, that's the old Piggly Wiggly on the hill. For those of you who can't find your pantry without using your GPS, that's 655 St. Andrews Road, 29210. Block out an hour or so and have fun! So that's what the top of my microwave looks like! You may recall that I have had recipes on top of my microwave for years. So many that they were quite literally jammed between the micro and the bottom of the kitchen cabinet. This is where I have always stuck anything I've torn out of a magazine, printed online, handwritten by a friend, or a friend's recipe that I scrawled on a napkin or piece of notebook paper. Even though this system has worked for me and it has existed for so long, it looked terrible and of course, there was always the possibility that one of those cherished pieces of paper could vanish. Back in high school, my sister and I took this same kind of stash of my mom's and organized it into a gigantic 3-ring binder. We all refer to it simply as "the red notebook." Not long ago, I was at mom & dad's and started thumbing through the red notebook. Then it hit me. Why haven't I done the same thing with all my "on top of the microwave" stuff? And, for some gratuitous cuteness, here's a photo of the Vivver and her new kitten, Turbo. Awwww. You're welcome!